Webster’s Online Dictionary defines magical as “being enchanting, captivating, fascinating, ravishing or alluring.” With that in mind, Mérida is a definitive fit. Each place I discover in Mexico certainly has its own personality, its own style and its own unique offerings. But once in a while I stumble upon a place that is so incredibly special that it almost takes my breath away. Mérida is one of those places. With the help and support of the Yucatán Tourism Office, airline tickets arranged by the excellent agents at Victory Travel in Los Angeles, and the unprecedented and absolutely perfect itinerary created by our hostess Ana Argaez of the Hotel Victoria, this was without question one of the best trips I have ever taken to Mexico. And, after 20+ years of traveling the country, that’s saying a lot! 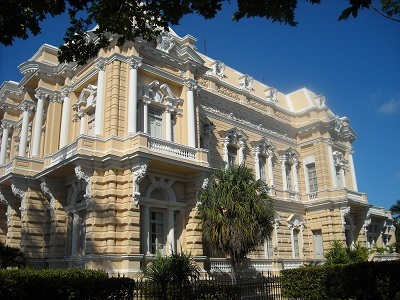 The Yucatán Peninsula is comprised of three states: Campeche, Yucatán, and Quintana Roo (the last being home to Cancun and the famous beaches of the Riviera Maya). The Caribbean beaches are fine for the tourist crowd, but the travelers who want to be moved by history, awed by beauty, and overwhelmed with soul, may want to look further inland to the Mexican state of Yucatán and its tropical colonial capital city of Mérida. Once the center of the Maya empire, Mérida is the perfect base for discovering some of the world’s most intriguing and well-preserved archeological sites. The city itself is a real charmer – European in design, yet undeniably Maya. Horse drawn carriages carry visitors down tree-lined boulevards past a fascinating mixture of Spanish and French colonial architecture. 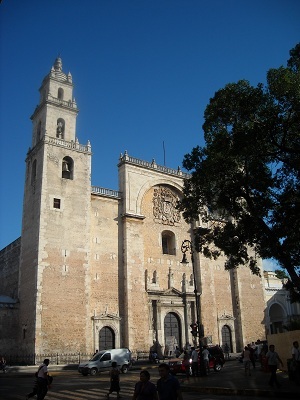 Founded in 1542, Mérida holds tightly to its roots. 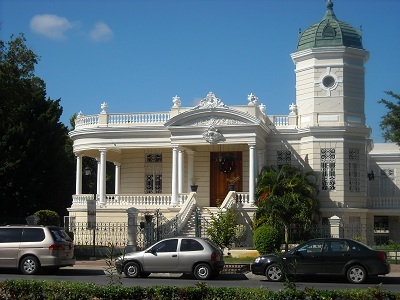 Elaborate turn-of-the-century mansions still stand as a reminder of the wealth that began in the 16th century with the area’s henequen boom. 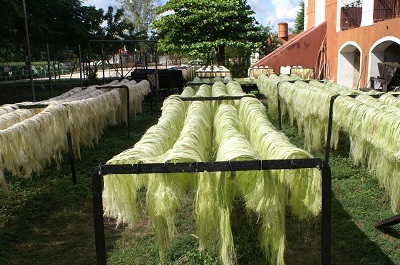 (Also known as sisal, the fibers from the henequen plant are used for rope products.) The main avenue, Paseo de Montejo, has been likened to the Champs Elysees and is one of the most impressive streets in all of Mexico. It’s worth a stroll from end to the other and be sure to stop by the small, yet rather remarkable, Museum of Anthropology. Another cornerstone of Mérida’s cultural experience is, of course, the food! 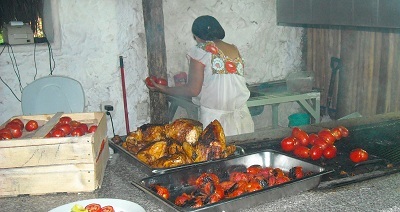 Yucatecan cooking is an extraordinary blend of Mayan, European and Mexican flavors. Try the queso relleno ( a whole Edam cheese (brought by the Dutch) hollowed out and stuffed with the spiced ground meat called picadillo), the Pollo or Cochinita Pibil (chicken or pork marinated with achiote paste, sour orange juice and other spices then wrapped in a banana leaf and baked), and my favorite: Poc Chuc (pork marinated in sour orange juice, grilled to perfection and served with pickled onions and a tangy tomato sauce.) The restaurant choices are almost endless, but I really enjoyed Pancho’s. Our hostess brought us here for some traditional favorites. This busy and popular spot has outdoor dining and great atmosphere. For a yummy and affordable lunch, Los Trompos is a good bet, and La Chaya Maya is also great for some authentic dishes. 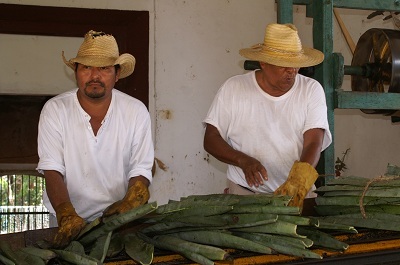 To completely understand Mérida and the Yucatán, it’s important to explore one of local haciendas to learn the history of the production of henequen (often called “green gold”). The Hacienda Sotuta de Péon is the only henequen hacienda in the area that still works to produce the fiber the same way it did 100 years ago. 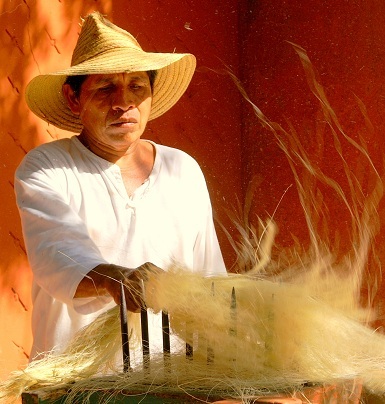 The fascinating guided tour lasts about two hours and takes you through the hacienda itself, and then demonstrates how the fiber is processed. The highlight (for me anyway!) 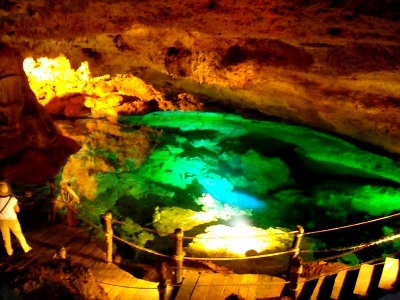 is that the tour ends at a private cenote on the property where you can swim in one of the area’s most picturesque underground sinkholes. 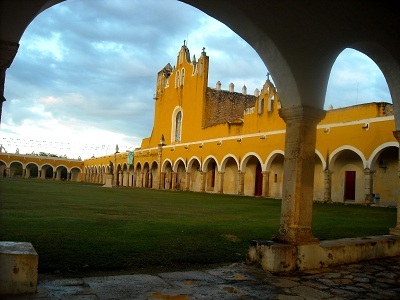 Izamal (eehs-ah-MAHL) is a “must” for a side trip from the city. Located east of Mérida and known as “the yellow city,” this charming town is highlighted by its bright mustard-yellow 16th century Franciscan convent (San Antonio de Padua) and is home to its own intriguing Mayan ruins. The pyramid of Kinich Kakmo is worth a climb just to take in the view. The convent itself (completed in 1562) is built atop the base of a destroyed Mayan temple and boasts the largest enclosed atrium in Mexico. 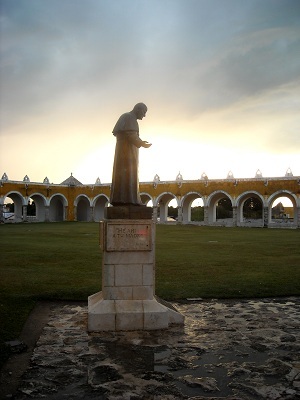 Pope John Paul visited in 1993 and has been commemorated by a statue of the Pope in the convent courtyard. Be sure to have lunch at Kinich. The classic Yucatecan cuisine is fantastic! Owner, Miriam Azcorra, welcomes you into her open-air palapa restaurant (and kitchen!) with a big smile, generous portions, and always a memorable meal. 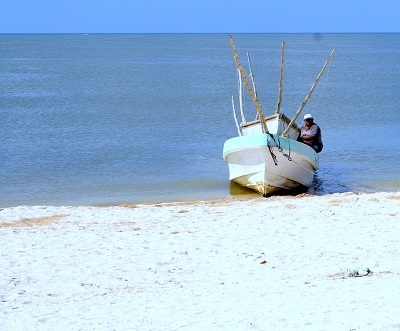 If the beach is in your plans… a day trip to Progreso should fit the bill. Don’t expect the dazzling waters of the Caribbean, but you will find clean, sandy beaches that bustle on holiday weekends. 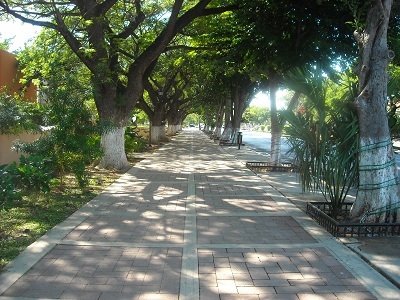 An attractive malecón (seaside walk) is dotted with plenty of seafood restaurants. Drop into Eladio’s for lunch and have a sampling of the botanas (appetizers). The pulpo (octopus) and ceviche are some of the best I’ve had in Mexico! Ask for suggestions from your waiter for a full meal of noshes and a fun afternoon on the beach. If you feel inspired to stay the night and dive into the local color, check out the charming Hotel Yakunah . Mérida’s energy is relaxed and the locals are warm and welcoming. The influence of their indigenous ancestors is unmistakable. This only scratches the surface of Mérida’s possibilities: it would take far more pages than I have here to even begin to convey the magnitude of what this part of Mexico is all about. It’s another world here…. a magical world you shouldn’t miss! There are hundreds of hotels and haciendas in just about every price range. We stayed at the Hacienda Xcanatun (a member or Mexico Boutique Hotels) and the slick, new Hotel Victoria. We also dropped by the famous Rosas y Xocolate for a property tour. 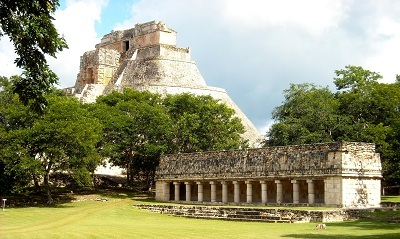 There is something for everyone here so my recommendation is that you go through the full listing of hotels on the Yucatan Today and read Merida hotel reviews at http://www.tripadvisor.com.